Frank L Johnston Shetland Ltd has been awarded the contract to build the long anticipated Breakwater and pier at Hamars Ness in Fetlar. Frank Johnston said that "We were delighted to be awarded the contract, and that work would start as soon as possible after all formalities had been completed. We hope to be onsite by early December". 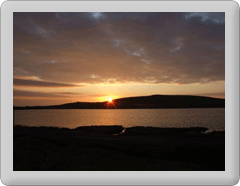 Fetlar Developments Ltd Chairman Nic Boxall commented that "It is a very positive step forward for the island. We look forward to the project being completed". Chairman of Fetlar County Council James Rendall said "He was delighted the breakwater and pier were finally going to come. Transport links are very important to any island and by having the ferry based here it would mean the timetable could be adjusted to better meet the needs of islanders". North Isles Councillor and member of Fetlar Working Group, Laura Baisley said "She was delighted the contract has been awarded, and to a local contractor who already employs one young man from the island. This has been a long awaited development which will have a significant effect on securing Fetlar’s future".